One-gloved Undines may be affordably priced, but the discount may not be enough to compensate for the fact that the apprentices are not as skilled as the experienced no-glove Undines. Salamander Akatsuki hires the apprentice Akari to rush him to the last ferry back to his floating island in the sky. Things do not go well. Snarky Akatsuki criticizes Akari until she is so shamed that she offers to hand the boat over to the far more experienced but far more expensive Alicia. Whose services Akatsuki, himself an apprentice, cannot afford. Salamanders are in charge of the equipment that keeps Aqua, once Mars, habitable. Some people have less than others on Aqua but nobody seems to go hungry. If there are hyper-rich oligarchs, there’s no evidence of it. Could this be that most undramatic of settings, one with a low Gini Coefficient? I am as shocked and horrified as you are. Akari embraces local tradition and buys a windchime with a luminescent clapper. But the glowing stone that serves as clapper will shine for only a month. The stone is a mineral not found on Earth. Would there be minerals on Mars/Aqua not found on Earth? I am reminded of Little Fuzzy’s sunstones … but they were the product of both geology and biology. Poor President Aria only wants to help with the annual spring cleaning! Alas, a thumbless cat of no particular dexterity or agility is more an impediment than assistant. Despondent, he leaves his beloved company forever. Or until dinner time, which ever comes first. I don’t know which element of this A Day in the Life story made me sadder; that nobody particularly noticed President Aria was missing or that this does not seem be the first time he’s become convinced he’s useless. Akatsuki is not a total jerk. He treats Alicia, Akari, and Aika to a tour of the floating island, one of Aqua’s many climate control stations. The tour ends with a treat unavailable on Earth: a fireworks display! Fireworks are apparently banned on Earth for some reason. This makes me sad: some of my happiest childhood memories involve perfectly legal fireworks and the imaginative ways we used them. Maintaining a pleasant climate on Aqua is an ongoing process. Aqua only gets half the sunlight Earth does and lacks sufficient mass to retain an atmosphere over the long run. The first time Aqua finds itself saddled with an administration that cheaps out on infrastructure, bad, bad things are going to happen. Although this does not seem to be the sort of world where short sighted people ever get their hands on the machinery of government. Another hint that this is some sort of (hissed) utopia. I understand why people compare this to Hitoshi Ashinano’s Yokohama Kaidashi Kikō. The plot is not driven by tension or by the need to avoid some terrible fate. Rather, it is a series of slice of life interludes, illuminating this or that aspect of the setting. Presumably the characters will have their arcs—Akria will become a full time Undine, Aika’s crush will be resolved, we might even find out what the hell President Aria is—but there’s no sense of urgency about any of it. Just sit back and enjoy the art. 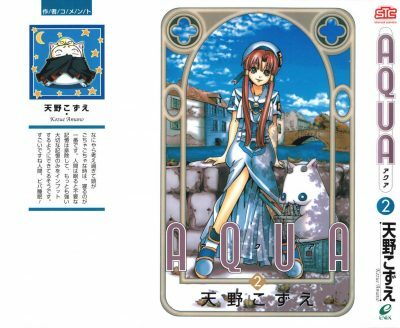 Aqua, Volume Two can be found here.